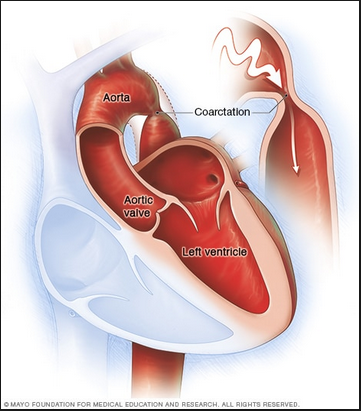 Aortic coarctation is an abnormality in the formation of the aorta that occurs congenitally. Coarctation simply denotes that a narrowing has occurred. The aorta happens to be the biggest artery in the body. Its dimension is about that of a garden hose. It exits the left ventricle of the heart, courses through the body, first through the chest region and then to the abdominal region. It gives out branches which assist in distributing fresh oxygen-rich blood to the lower extremity. When there is a narrowing of the aorta, this function is impaired resulting in reduced oxygen delivery. The part most likely to get narrowed is that around the exit point at the heart. It looks like a kink happening in a hose. As the heart struggles to pump blood rich in oxygen to the systems, there is an obstruction of flow due to the kinking. The end result is a buildup of or an increase in blood pressure in the upper extremities and a decrease in blood flow to the lower extremities. Diagnosis and treatment through surgery are usually done in a little while after birth. Children that have aortic coarctation often grow up as other normal children with healthy lives but bear in mind that these particular children have a greater chance of coming down with hypertension and heart problems if the aortic coarctation is left untreated till they are older. They may require a close medical watch over time. Untreated cases may result in death, this death is usually as a result of complications of hypertension or from other heart diseases. In newborn, the symptoms experienced are consistent with the severity of the aortic coarctation. KidsHealth reports that majority of newborns with aortic coarctation are symptomless. Others may develop difficult breathing or feeding. Symptoms still include sweating, increased blood pressure, and congestive heart failure. 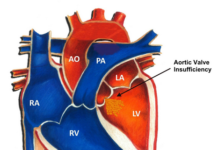 Aortic coarctation is a frequently occurring type of congenital heart malformation. It may occur in isolation or can occur along with other heart malformations. It has a gender predilection for males as it is seen more in them. The usual congenital heart abnormalities it occurs with include Shone’s complex and DiGeorge syndrome. It is an abnormality that starts when the fetus is forming, still, the causes are not clear. Previously, it was thought by doctors to be more prevalent in Caucasians than blacks and other races. It has been noted of recent that this thought of it being more common in Caucasians could just be because they tend to detect the condition faster than others. More studies hypothesize that all races have an equal likelihood of occurrence of aortic coarctation. On the good side, the likelihood of having a child born with an aortic coarctation is low. KidsHealth reports that aortic coarctation occurs in 8 out of 100 children born with heart defects. Centers for Disease Control (CDC) state that 4 out of 10,000 newborn children have coarctation of the aorta. When a newborn is first examined, the diagnosis of aortic coarctation can be made then. This is by identifying differences in the blood pressure between the upper and lower parts of the body. Also, when the heart is being listened to, they may hear abnormal sounds that are usual for aortic coarctation. When these preliminary checks have been identified, the doctor will then request for investigations to confirm the diagnosis and these include echocardiography, magnetic resonance imaging, and cardiac catheterization. Following the diagnosis of aortic coarctation in a child, the common treatments include balloon angioplasty and surgery. In balloon angioplasty, a catheter is inserted into the narrowed artery and the balloon is then inflated to help expand it. 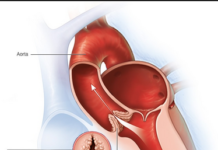 A surgical modality of treatment has to do with removing the kinked portion of the aorta and replacing it. Another option is using a graft to bypass the narrowed portion or by making a patch above the constricted portion to expand it. Adults who may have been treated during childhood have a high risk of recurrence and this may necessitate further surgery later in life. Also, any weak area of the aorta will need repair. 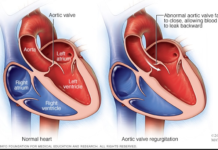 Aortic coarctation that is not treated will mostly be fatal and people with this condition die around 30 or 40 years due to resultant heart failure, ruptured aorta, stroke or other conditions. A long-standing increase in blood pressure as a resultant effect of aortic coarctation increases the likelihood of developing heart injury, aneurysm, stroke, early-onset coronary artery disease. It can also result in renal failure, liver failure, and blindness due to hypertensive retinopathy. Angiotensin converting enzyme (ACE) inhibitors such as ramipril and beta-blockers may be taken by those with aortic coarctation to regulate the blood pressure. Exercise daily, let the type of exercise majorly be aerobic. 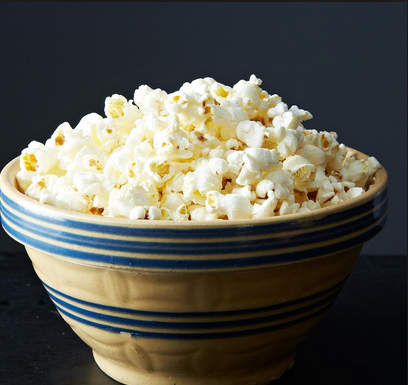 This is particularly good for keeping a health weight and subsequently improves cardiovascular health and it also helps to bring down the blood pressure. Do not carry out strenuous exercises like lifting of weights because this further stresses the heart. Quit taking tobacco in any form.